Claire Bastian has a secret, a secret which torments her as she watches Sean Adams destroying the dreams and hopes of the small community of Sackets Harbor, NY. Finally, after nearly a year of planning, she decides to take action. She feels responsible for Sean because he is her son, given up for adoption at birth. When he grows up to be so evil, Claire feels horrible guilt, as if it were all her fault. 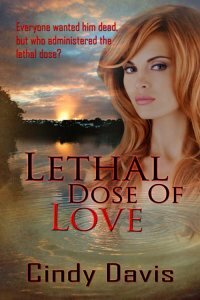 The first part of Lethal Dose of Love is told from Claire’s point of view and I watched as she plans and carries out her deadly scheme. But did she succeed? So many residents of Sackets Harbor want him dead and when he does die, it is on his boat during a race, his fellow sailor dying also. Suspicion falls on everyone whom Sean had wronged, especially the women since he was poisoned. Payton Winters is still grieving for her husband, who was murdered in a home burglary. She moved to Sackets Harbor in an effort to heal, but now this murder has brought back all her memories of her beloved husband’s murder, a murder which was never solved. On top of that, the plant used to poison Sean came from her new exotic plant shop. Payton can’t face the memories from her past, but she finds some healing energy from trying to solve Sean’s murder, little realizing that she herself could become the next victim. The characters are well defined and very believable. The small town of Sackets Harbor seems real as well, with the quirks expected from such a community. My only complaint with this novel is that it could have used another round of editing, with special attention paid to the use of pronouns. Sentences such as “she’d come to patch things up between she and Helen” are very jarring and pulled me out of the story. Thankfully, there were not many of these, but some editing would help. The plot moves well, and there are a number of excellent action scenes. I didn’t figure out the murderer until the very end. Those who love cozy mysteries will certainly enjoy trying to figure out who gave Sean his just desserts.